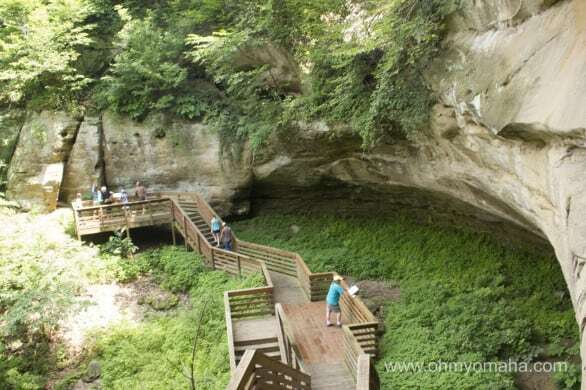 Note: This visit to Indian Cave State Park was part of a full day trip from Omaha. Most of the day was spent in Brownville, which you can read about in yesterday’s post. 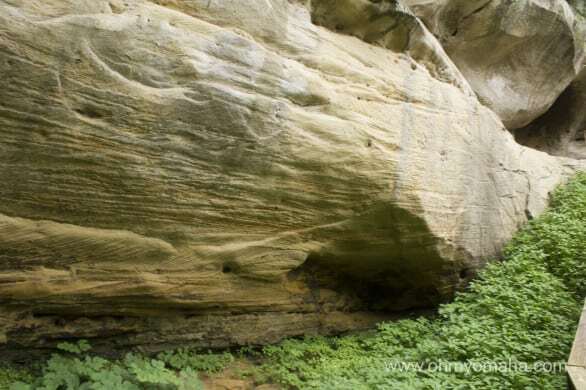 Not far from the Missouri border, about 10 miles from Brownville, is the Nebraska attraction, Indian Cave State Park. 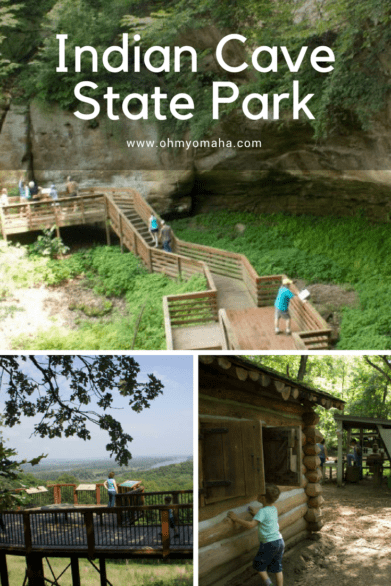 A little off the beaten path, this gorgeous park is located near the Missouri River and is known for its namesake, Indian Cave. 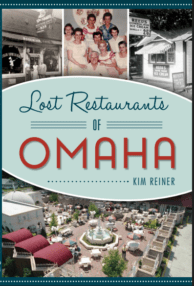 For a detailed history, head to the Journal Star. If you’ve been to the Loess Hills in southwest Iowa, this park will have a familiar feel to it given that it is, in fact set in the Loess Hills (new fact for me, I didn’t think Nebraska could claim Loess Hills). Indian Cave, one of the attractions of this Nebraska state park. There are lots of campsites – and backcountry camping is allowed – so Mr. Wonderful and I decided we may just come back in the fall to camp here. With a park map in hand, that’s where we headed to first. Having only seen one picture of the park, I honestly expected the cave to be cavernous. Something we could walk in and explore. Maybe it’s the “Goonies” fan in me. What we saw, then, was a disappointment. Here’s the cave, which you can see from a wooden walkway. The graffiti couldn’t be ignored. It covered the walls of this landmark. 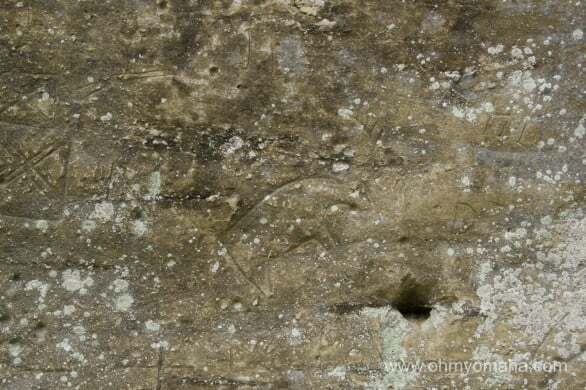 Prehistoric drawings mixed in with some modern idiot graffiti. Farley and I did attempt to find the prehistoric petroglyphs of animals on the wall amid the graffiti. Looking for prehistoric cave drawings. We both lost interest quickly and headed back to the car, where a sleeping Mooch and bored Mr. Wonderful waited. Onward into the park we drove. We made a pitstop to play in an ancient park. The hypochondriac in me didn’t like the chipping paint and sharp metal edges on the playground equipment but the kids loved the place. Can’t drive past a park without stopping to play, now can we? 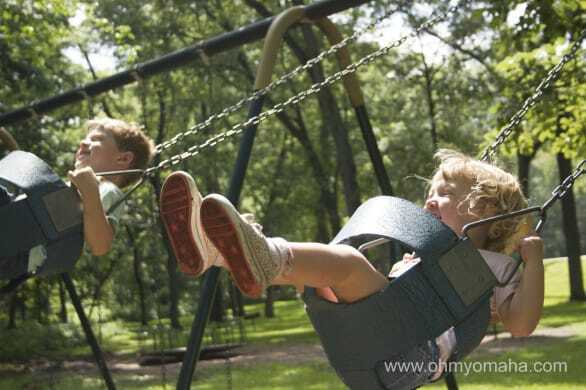 The swings were a hit. Our next stop was at the Living History cabins. 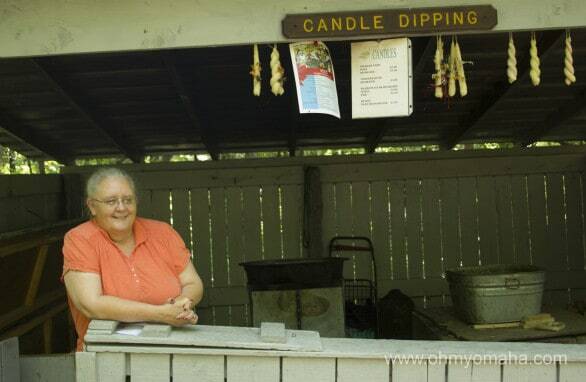 The resident soap maker, blacksmith, candle maker and broom maker are there on Saturdays and Sundays from 9 a.m. to 4 p.m. (from Memorial Day into October). We arrived near 4 p.m. and so did a quick run through the area. The cabin was the most interesting to the children. 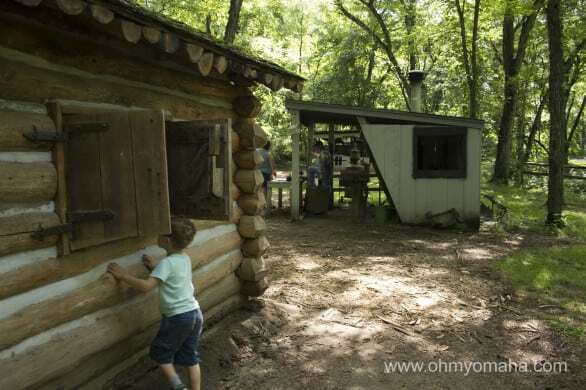 The living history cabins and display booths are open weekends during the summer. Our final stop was a scenic overlook. We watched five raptors soar in the wind. 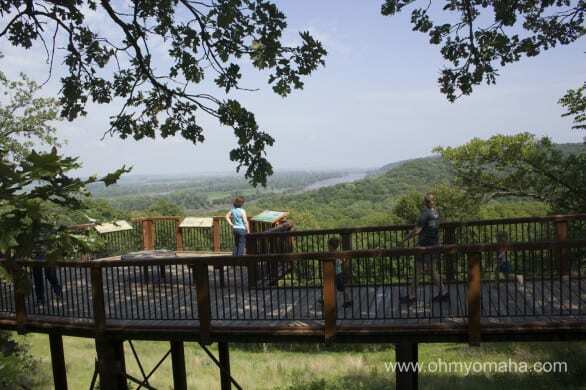 A scenic lookout at Indian Cave State Park. It was peaceful, until Mooch broke out into “Let It Go” and Farley interrupted my brief history lesson by asking when the aliens came. I think we were all ready to call it a day. There is a lot more to explore in the park, so we’ll return someday soon. South on Highway 75, East on Highway 136 (9 miles), South on Highway 67 (9 miles), East on Highway 64E (5 miles). Or you can take Interstate I-29 South, take Exit 110 to Brownville. Follow US-136 West (7 miles), South on NE-67 S (9 miles), East on NE-64E (5 miles). Continue on NE-64F Recreation Road and you’ll get there. – Halloween is celebrated throughout October. 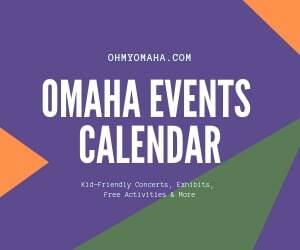 Expect hayrack rides on certain dates, as well as a haunted forest. After hearing the soapmaker describe it (The Headless Horseman makes an appearance with a chainsaw), I’d suggest only older kids go to it! So very pretty! We have not been down there yet – we definitely need to make that happen! I really like your highlight section at the end – will definitely reference that before we head down there! I think we were lucky to have such an odd spring and early summer – it made for a really lush forest down there. We didn’t even get to explore any of the trails, so we’ll be back. it’s a bummer I was thinking of taking my kids there… it’s so commercialized now… (no bordwalk before) we hiked up high and found a cave we could crawl in and crawl backwards out of plus when we went they had an Indian festival of sorts which I’ve heard they still do. I didn’t know there were more caves to be found there. As far as commercialization, I didn’t get that sense, but then again, it was all new to me. I have no idea how it once was. I was so excited at first when you said caves and a day trip. I grew up in the black hills where there is numerous walk through caves. I inagined a whole trip and day so i could show my kids what i grew up around before i read the article. Now kind of sad to see no real caves but still looks like a nice place. I feel your pain. It’s definitely not the walk-through cave I was hoping for, but at least we discovered some unexpected gems in the park. So glad I decided to check Pinterest and subsequently found your blog. 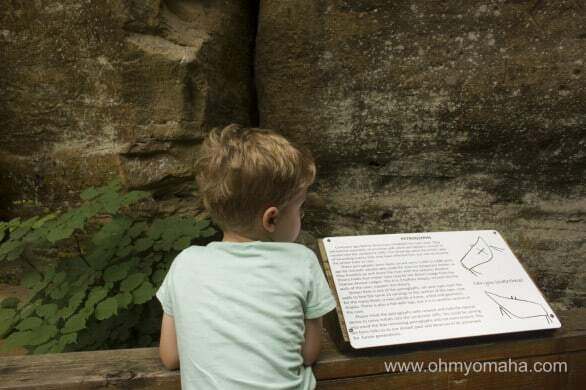 We are a homeschooling family learning about caves and I was hoping Indian Cave State Park would be a great place to go for a day trip to explore caves. We were up at Wind Cave in South Dakota two years ago, but both my children are too young to remember it. Thanks for sharing that the cave is a bit of a disappointment. We will probably visit another t time as it does seem they have some fun, interesting things to do. I’m glad you found it helpful! It’s true, you won’t be going inside a cave when you visit Indian Cave, but I suppose if you’re studying pictographs, it’d be interesting. 🙂 Incidentally, we’re headed up to South Dakota this summer and Wind Cave is on our list to visit! Would you say the shortest tour there is OK for young kids?